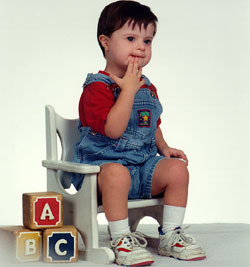 J P is an active, almost two year old child with Down Syndrome. 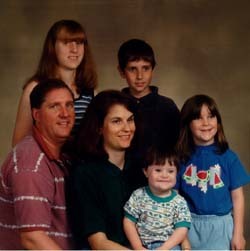 He lives with his Mom (Lorna), Dad (David), two sisters, and an older brother. Their days are filled with family activities and church functions. The family does many things outside the home together, but they also enjoy spending "quality time" together at home. J P enjoys playing ball, musical toys, singing and dancing, and swimming. He plays blocks and climbs on his "Little Tykes" gym. Lorna and David strive to spend time with each child individually to meet their needs, and to participate as a family in activities. J P often attracts attention from the friends of his brother and sisters and never lacks for play partners. J P and Lorna recently began going to a parent-child play group each week. He initiates communication with the five other girls in the group and is known as "Mr. Social!" 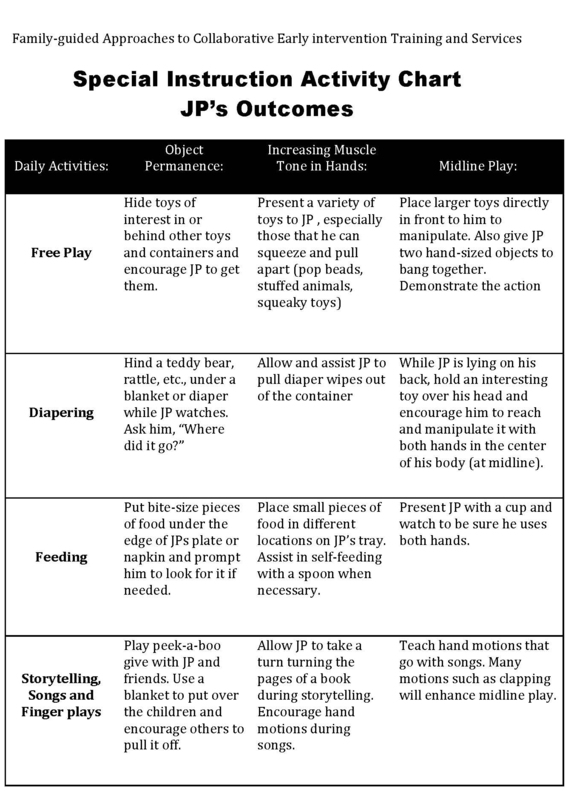 J P's typical daily routines and activities were identified by his family, care providers, and interventionists for home and child care settings. From the very large list of possibilities, the routines and activities which occurred most consistently and were most appropriate for the outcomes identified on his IFSP were identified by placing them in circles around their location to form a web of opportunities. Those routines indicated with handprints in the above webs were chosen as contexts for embedding outcomes because these activities occur on a frequent basis both at home and at child care, were enjoyable for J P, and were identified by his family and care providers as preferred times for themselves. J P's early intervention team, including his family and care providers, designed the following plan for targeting the identified outcomes throughout his day. This activity chart, while not meant to delineate specific methods, cues, and contingencies, served as a written reminder to all facilitators for strategies to promote acquisition of skills. The following data collection form was used by J P's family to document progress for his "using gestures" outcome. It was posted above J P's toy shelf, and family members were able to record the frequency of pointing to request a toy as well as indicate the types of toys J P chose most often. J P's family is awaiting his third birthday with mixed feelings, excited for all that he's done but nervous about the transition to a different system. He's accomplished a lot in the past year. J P (also still affectionately called "Mr. Social") is enjoying being included in the classroom at the child care he attends. He has learned many self-help skills, from taking off his shoes and socks (again and again) to brushing his teeth. He is beginning to work on potty training. He learns best by watching his new 3 year old friends. J P's intervention planning worksheet was used by the interventionists to summarize and monitor his program plan. 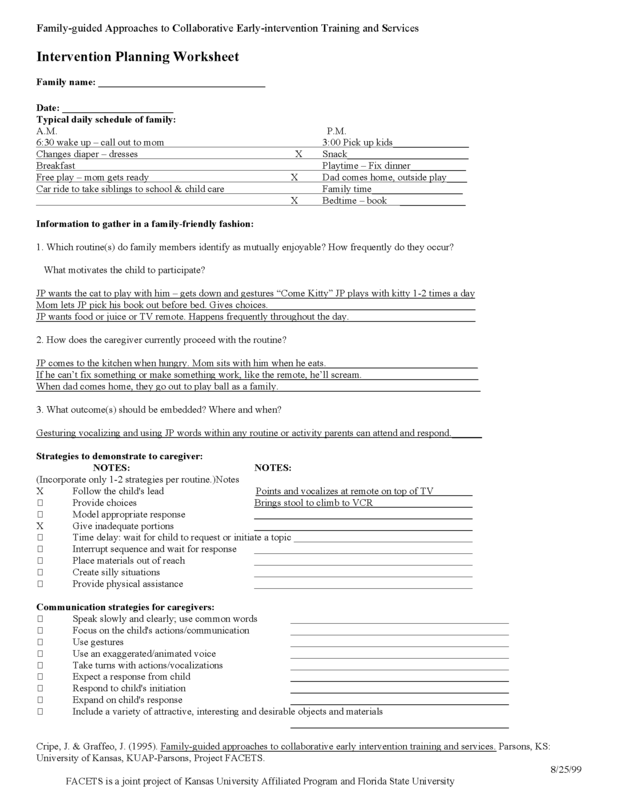 This planning sheet provides an ongoing record of pertinent family guided routine information, outcomes that reflect the family's concerns and priorities, and intervention strategies that were modeled and practiced with the family members. It provides a "running record" for the team members to assist with an integrated approach that doesn't overwhelm the family members with either too many things to do or too many different strategies to use. The following matrices are reflective of the many new things that J P is learning to do. These plans also reflect his family's and careproviders' changing preferences for routines appropriate for targeting recently identified outcomes and in preparation for his upcoming transition. Life happens and as in so many busy families routines in the summer change significantly. All three older siblings were active in sports as well as Dad who coaches. Big Sister Jennifer had an opportunity to play in the World Series Softball Tournament which meant that much of the family's life revolved around the ball field. In order to optimize the learning opportunities that naturally occur at the ball field, the following planning tool was developed. Mr. Social has remained true to his name. He is in full time attendance at the preschool associated with the university where his mom works. He is fully included in the classroom with his typically developing peers. As the oldest in the classroom (almost 3 years old!! ), he is starting to assume a leadership role with the other children. If one of his classmates breaks a classroom rule, J P is the first to tattle to the teacher using quite animated gestures (he's still working on getting those pesky little words). Mom and Dad are very pleased with how well J P is learning from his peers (even those things that parents don't always like to see, such as foot stomping). He is receiving his speech, occupational and physical therapies at the childcare center. The therapists involve all of the care providers so that J P has many more opportunities to practice. The team (which is led by the parents) has adopted a communication book to ensure that everyone is working together with a united effort to maximize J P's potential for success. The special instructor visits with J P and his family at home to help ensure that the strategies being used at the childcare are being carried over to the family's routines at home. As Mr. Social approaches 3 and prepares to transition into the school system, Mom particularly has some concerns. The family has decided to keep J P at his childcare center and the school system will be able to provide services there. Fortunately for J P, and Mom 's peace of mind, he will be able to have many of the same therapists with the school system that he had with early intervention. This will help make the transition more seamless.